Hi Karen ... thanks ..
thank you .... I always hear the robin before I see him ..
Terratoonie ...dusky my rabbit has a little robin friend that comes sees him (dusky) every-morning and mid afternoon... at nesting time the robin would now and again take a beak full of dusky's hay :)... he sits on a perch sings.. gets his seeds from neighbours garden then comes to see dusky...dusky will go to him and sit watching him ... now and again beak and rabbits nose almost touch...how cute is that? Terra, it is delightful scene with a robin and the blue sky. Pouring rain where I live all week. Jane, I know your story was for Terratoonie but I liked it too. Thanks Jane, Neena and Klahanie ..
Great picture Terra, I love to hear my robin sing, such a cheerful sound. Thank you Homebird and Sheila .. This is beautiful Terratoonie, I have added it to my favourites so that I can look at it over and over! You even caught him with his beak open at full throttle!! A little Robin and Sparrows used to visit my bird feeder and water stool at my old house where the garden was more of a wildlife one. I miss those sightings. Hi GM rainbow .. Thank you for visiting .. I have about 50 sparrows around my garden .. Thank you Gemini and Helenium. 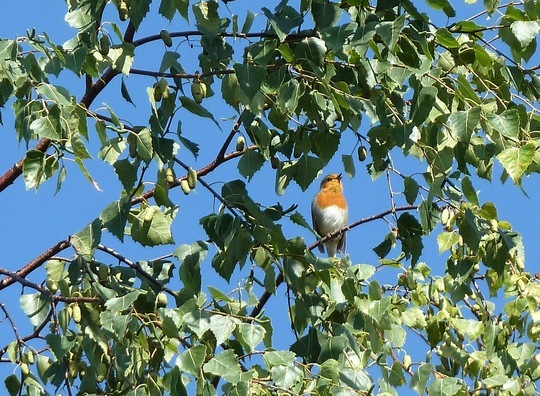 We often see Robins when my wife are walking in the early morning to her place of work! I often see them on the allotment as well. Together with Blackbirds & an occasional Thrush Robins are very often seen close by. They have such incredible eyesight as well! Even if I get down to almost lay my cheek on the recently dug soil I still can't see the little worms they somehow see! They fill their beaks to overflowing & keep dropping them before giving up trying to squeeze just one more into an overfull beak already & flying off to its nest! You were ever so lucky to get such a good shot, TT! Yes, robins are a joy to have around. This afternoon I was standing at the far end of my garden, with my face just below the top of the fence. he was perched looking at me, about 4 inches from my nose .. and he didn't seem bothered at all .. just a cheeky look at me ! That must have been a fantastic experience, TT! Glad your robin is getting more bold ..
My robin sang for the whole of Christmas Day ..